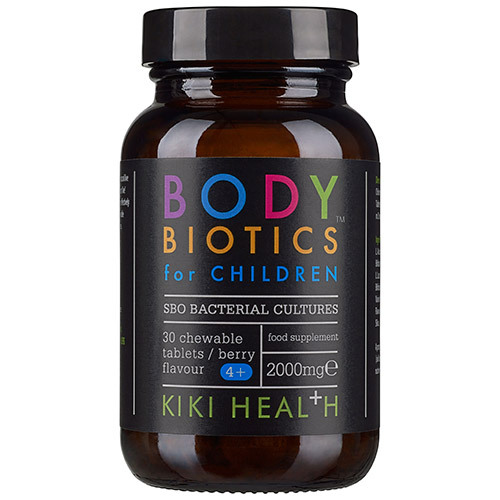 KIKI Health Body Biotics for Children is a specially formulated probiotics for children of 4 to 11 years of age. A daily blend of carefully selected, soil based natural live cultures, including an abundance of lacto and bifido strains. Body Biotics for Children contains live and thriving SBOs, that are only activated once ingested and in turn effectively re-populate the intestine with a beneficial balance of friendly bacteria. Each 2000mg chewable tablet is a blend of SBOs (Soil Based Organisms) and packed with additional friendly live bacteria. L. Acidophilus, L. Plantarum, L. Rhamnosus, Bifidobacterium Bifidum, B. Lichenformis, B. Subtilis, L. Lactis, L. Casei, Bifidobacterium Infantis, Bifidobacterium Longum, DDS-1L. Acidophilus, Variant OM L. Salvarius, Dextrose, Natural Strawberry Flavour & Raspberry Flavour, Magnesium Stearate, Silica. A proprietary formula of bacteria cultures and SBOs (Soil Based Organisms) symbiotically blended in a nutrient-rich host medium of Fulvic & Humic Acids. Suitable for children aged 4-11 years. Take one tablet daily either 30 minutes before food, or 2 hours after a meal. Food supplements should not be used as a subtitute for a varied diet. Do not take if on any other medication, see medical practitioner before use. 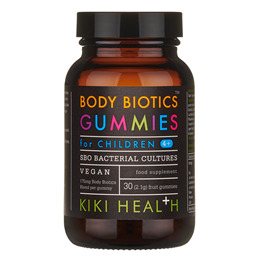 Below are reviews of KIKI Health Body Biotics for Children - 30 Tablets by bodykind customers. If you have tried this product we'd love to hear what you think so please leave a review.